"Lula" redirects here. For other uses, see Lula (disambiguation). Lula has been called one of the most popular politicians in the history of Brazil and while in office was one of the most popular in the world. He was featured in Time's 2010 The 100 Most Influential People in the World and Perry Anderson called him "the most successful politician of his time". In October 2011, Lula, who was a smoker for 40 years, was diagnosed with throat cancer and underwent chemotherapy, leading to a successful recovery. In early 2016, Lula was appointed Chief of Staff under Rousseff, but Justice Gilmar Mendes of the Supreme Federal Court blocked the appointment due to ongoing federal investigations. On 12 July 2017, Lula was convicted of money laundering and passive corruption, defined in Brazilian criminal law as the receipt of a bribe by a civil servant or government official. Lula was sentenced to nine years and six months in prison by judge Sérgio Moro, but he remained free pending an appeal of the sentence. On 24 January 2018, the Regional Federal Court of the 4th Region, which is a panel of three appellate judges, unanimously upheld Moro's ruling against Lula and increased the sentence to 12 years. On 5 April 2018, the Supreme Federal Court voted to reject Lula's habeas corpus plea and on the same day a warrant was issued for his arrest. He turned himself in and began serving his sentence on 7 April 2018. Lula announced his candidacy for the 2018 presidential election, but he was disqualified from running under Brazil's Clean Slate Law by the Superior Electoral Court on 31 August 2018 and was replaced by Fernando Haddad on 11 September 2018. The United Nations Human Rights Committee requested that the Brazilian government allow Lula to exercise his political rights as a presidential candidate. Prior to being barred, Lula led all scenarios in polls for the October election, achieving 39 percent in voter intentions within one month of the first round. Luiz Inácio da Silva was born on 27 October 1945 (registered with a date of birth of 6 October 1945) in Caetés (then a district of Garanhuns), located 250 km (150 miles) from Recife, capital of Pernambuco, a state in the Northeast of Brazil. He was the seventh of eight children of Aristides Inácio da Silva and Eurídice Ferreira de Melo. Two weeks after Lula's birth, his father moved to Santos, São Paulo, with Valdomira Ferreira de Góis, a cousin of Eurídice. He was raised Roman Catholic. Lula's mother was of partial Italian descent. In December 1952, when Lula was only 7 years old, his mother decided to move to São Paulo with her children to rejoin her husband. After a journey of thirteen days in a pau-de-arara (open truck bed), they arrived in Guarujá and discovered that Aristides had formed a second family with Valdomira. Aristides' two families lived in the same house for some time, but they did not get along very well, and four years later, Eurídice moved with her children to a small room behind a bar in São Paulo. After that Lula rarely saw his father, who became an alcoholic and died in 1978. Lula was married twice. In 1969, he married Maria de Lourdes, who died of hepatitis in 1971, while pregnant with their first son, who also died. Lula and Miriam Cordeiro had a daughter, Lurian, born out of wedlock in 1974. In 1974, Lula married Marisa Letícia Rocco Casa, a widow with whom he then had three sons. He also adopted Casa's son from her first marriage. They remained married until her death on 2 February 2017 after a stroke. Lula had little formal education. He did not learn to read until he was ten years old, and quit school after the second grade to work and help his family. His first job at age 12 was as shoeshiner and street vendor. By 14 he had a formal job in a warehouse. He lost the little finger on his left hand at 19 in an accident, while working as a press operator in an automobile parts factory. After the accident he had to run to several hospitals before he received medical attention. This experience increased his interest in participating in the Workers' Union. Around that time, he became involved in union activities and held several important union posts. Due to perceived incompatibility between the Brazilian military government and trade union activities, Lula's views moved further to the political left. Inspired by his brother Frei Chico, Lula joined the labour movement when he worked at Villares Metals S.A, rising steadily through the ranks. He was elected in 1975, and reelected in 1978, as president of the Steel Workers' Union of São Bernardo do Campo and Diadema. Both cities are located in the ABCD Region, home to most of Brazil's automobile manufacturing facilities, including Ford, Volkswagen, Toyota, Mercedes-Benz and others, and are among the most industrialized in the country. In the late 1970s, when Brazil was under military rule, Lula helped organize union activities, including major strikes. Labour courts found the strikes illegal, and Lula was jailed for a month. Due to this, and like other people imprisoned for political activities under the military government, Lula was awarded a lifetime pension after the fall of the military régime. On 10 February 1980, a group of academics, intellectuals, and union leaders, including Lula, founded the Partido dos Trabalhadores (PT) or Workers' Party, a left-wing party with progressive ideas created in the midst of Brazil's military government. In 1982, he added the nickname Lula to his legal name. In 1983 he helped found the Central Única dos Trabalhadores (CUT) union association. In 1984, PT and Lula joined the popular Diretas Já! (Direct [Elections] Now!) campaign, demanding a direct popular vote for the next Brazilian presidential election. According to the 1967 constitution, Presidents were at that time elected by both Houses of Congress in joint session, with representatives of all State Legislatures; this was widely recognised as a mere sham as, since the March 1964 coup d'état, each "elected" President had been a retired general chosen in a closed military caucus. Lula and the PT supported the public demand for a change in the electoral system. But the campaign was defeated by a vote in Congress that rejected an amendment calling direct elections for the following year, and, in 1985, a civilian president, Tancredo Neves, was elected by the same indirect procedure, with Lula's support. Only four years later, as a direct result of Diretas Já! and after years of popular struggle, the 1989 elections were the first in 29 years to elect a president by direct popular vote. 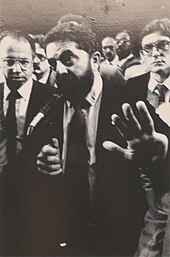 Lula first ran for office in 1982, for the state government of São Paulo, and lost. In the 1986 elections Lula won a seat in Congress with the most votes nationwide. The Workers' Party helped write the country's post-military government Constitution, ensuring strong constitutional guarantees for workers' rights, but failed to achieve a proposed push for agrarian reform in the Constitutional text. Under Lula's leadership, the PT took a stance against the Constitution in the 1988 Constituent Assembly, reluctantly agreeing to sign the agreed draft at a later stage. 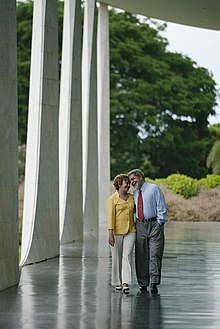 In 1989, still as a Congressman, Lula ran as the PT candidate in the first democratic elections for president since 1960. Lula and Leonel Brizola, two popular left-wing candidates, were expected to vie for first place. Lula was viewed as the more left-leaning of the two, advocating immediate land reform and a default on the external debt. However, a minor candidate, Fernando Collor de Mello, former governor of Alagoas, quickly amassed support among the nation's élite with a more business-friendly agenda. Collor became popular taking emphatic anti-corruption positions; he eventually beat Lula in the second round of the 1989 elections. In 1992, Collor resigned, under threat of impeachment for his alleged embezzlement of public money. Lula refused to run for re-election as a Congressman in 1990, busying himself with expanding the Workers' Party organizations around the country. As the political scene in the 1990s came under the sway of the Brazilian real monetary stabilization plan, which ended decades of rampant inflation, former Minister of Finance Fernando Henrique Cardoso (Brazilian Social Democracy Party (PSDB)) defeated Lula in 1994 and again, by an even wider margin, in 1998. Before winning the presidency in 2002, Lula had been a strident union organizer known for his bushy beard and Che Guevara T-shirts. In the 2002 campaign, Lula foreswore both his informal clothing style and his platform plank of linking the payment of Brazil's foreign debt to a prior thorough audit. This last point had worried economists, businessmen and banks, who feared that even a partial Brazilian default along with the existing Argentine default would have a massive ripple effect through the world economy. Embracing political consultant Duda Mendonça's advice to pursue a more media-friendly image, Lula became president after winning the second round of the 2002 election, held on 27 October, defeating the PSDB candidate José Serra. On 1 October 2006, Lula narrowly missed winning another term in the first round of elections. He faced a run-off on 29 October and won by a substantial margin. In an interview published 26 August 2007, he said that he had no intention to seek a constitutional change so that he could run for a third consecutive term; he also said that he wanted "to reach the end of [his] term in a strong position in order to influence the succession." In early September 2018, Brazil's top electoral court banned former president Lula da Silva from running for President on the 2018 Brazilian general election due to his corruption conviction, in accordance with Lei da Ficha Limpa. Instead, Fernando Haddad ran for President on the Workers Party ticket, and was defeated by Jair Bolsonaro, after securing nearly 45 percent of the popular vote in a run-off between the candidates. Lula served two terms as president and left office on 1 January 2011. During his farewell speech he said he felt an additional burden to prove that he could handle the presidency despite his humble beginnings. "If I failed, it would be the workers' class which would be failing; it would be this country's poor who would be proving they did not have what it takes to rule." Since the beginning of his political career to the present, Lula has changed some of his original ideas and moderated his positions. Instead of the drastic social changes he proposed in the past, his government chose a reformist line, passing new retirement, tax, labour and judicial legislation, and discussing university reform. Very few of the proposed reforms were actually implemented during Lula's terms of office. Some wings of the Worker's Party disagreed with the increasing moderation in focus since the late eighties and have since left the party to form dissident wings such as the Workers' Cause Party, the United Socialist Workers' Party and during Lula's presidency the Socialism and Liberty Party. Alliances with old, traditional oligarch politicians, like former presidents José Sarney and Fernando Collor, have been a cause of disappointment for some. Lula put social programs at the top of his agenda during the campaigns and after election. From very early on his leading program was to eradicate hunger, following the lead of projects already put into practice by the Fernando Henrique Cardoso administration, but expanded by the new Fome Zero ("Zero Hunger") program. This program brings together a series of programs with the goal to end hunger in Brazil, including the construction of water cisterns in Brazil's semi-arid region of Sertão, plus actions to counter teenage pregnancy, to strengthen family agriculture, to distribute a minimum amount of cash to the poor, and many other measures. The largest assistance program, however, was Bolsa Família (Family Allowance), which was based upon the previous Bolsa Escola (School Allowance), which was conditional on school attendance, first introduced in the city of Campinas by then-mayor José Roberto Magalhães Teixeira. Not long thereafter, other municipalities and states adopted similar programs. President Fernando Henrique Cardoso later federalized the program in 2001. In 2003, Lula formed Bolsa Família by combining Bolsa Escola with additional allowances for food and kitchen gas. This was preceded by the creation of a new ministry – the Ministry of Social Development and Eradication of Hunger. This merger reduced administrative costs and bureaucratic complexity for both the families involved and the administration of the program. Fome Zero has a government budget and accepts donations from the private sector and international organizations. The Bolsa Família program has been praised internationally for its achievements, despite internal criticism accusing it of having turned into an electoral weapon. Along with projects such as Fome Zero and Bolsa Família, another Lula administration flagship program was the Growth Acceleration Program (PAC). The PAC had a total budget of $646 billion reais (US$353 billion) by 2010, and was the Lula administration's main investment program. It was intended to strengthen Brazil's infrastructure, and consequently to stimulate the private sector and create more jobs. The social and urban infrastructure sector was scheduled to receive $84.2 billion reais (US$46 billion). As Lula gained strength in the run-up to the 2002 elections, the fear of drastic measures, and comparisons with Hugo Chávez of Venezuela, increased internal market speculation. This led to some market hysteria, contributing to a drop in the value of the real, and a downgrade of Brazil's credit rating. In the beginning of his first term, Lula's chosen Minister of Finance was Antonio Palocci, a physician and former Trotskyist activist who had recanted his far left views while serving as the mayor of the sugarcane processing industry center of Ribeirão Preto, in the state of São Paulo. Lula also chose Henrique Meirelles of the Brazilian Social Democracy Party, a prominent market-oriented economist, as head of the Brazilian Central Bank. As a former CEO of the BankBoston he was well-known to the market. Meirelles was elected to the Chamber of Deputies in 2002 as a member of the opposing PSDB, but resigned as deputy to become Governor of the Central Bank. Silva and his cabinet followed in part the lead of the previous government, by renewing all agreements with the International Monetary Fund, which were signed by the time Argentina defaulted on its own deals in 2001. His government achieved a satisfactory primary budget surplus in the first two years, as required by the IMF agreement, exceeding the target for the third year. In late 2005, the government paid off its debt to the IMF in full, two years ahead of schedule. Three years after the election, Lula had slowly but firmly gained the market's confidence, and sovereign risk indexes fell to around 250 points. The government's choice of inflation targeting kept the economy stable, and was complimented during the 2005 World Economic Forum in Davos. The Brazilian economy was generally not affected by the mensalão scandal, which related to vote buying in the Brazilian Congress. In early 2006, however, Palocci had to resign as finance minister due to his involvement in an abuse of power scandal. Lula then appointed Guido Mantega, a member of the PT and an economist by profession, as finance minister. Mantega, a former Marxist who had written a PhD thesis (in Sociology) on the history of economic ideas in Brazil from a left-wing viewpoint, was known for his criticism of high interest rates, something he claimed satisfied banking interests. Mantega was also supportive of a higher level of employment by the state. Not long after the start of his second term, Lula's government announced the Growth Acceleration Program (Programa de Aceleração de Crescimento, PAC), an investment program to solve many of the problems that prevented the Brazilian economy from expanding more rapidly. The measures included investment in the creation and repair of roads and railways, simplification and reduction of taxation, and modernization of the country's energy production to avoid further shortages. The money pledged to be spent on this program was considered to be around R$ 500 billion (more than 250 billion dollars) over four years. Prior to taking office, Lula had been a critic of privatization. In his government, however, his administration created public-private partnership concessions for seven federal roadways. After decades with the largest foreign debt among emerging economies, Brazil became a net creditor for the first time in January 2008. By mid-2008, both Fitch Ratings and Standard & Poor's had elevated the classification of Brazilian debt from speculative to investment grade. Banks made record profits under Lula's government. Under Lula, Brazil became the world's eighth-largest economy, more than 20 million people rose out of acute poverty and Rio de Janeiro was awarded the 2016 Summer Olympics, the first time the Games will be held in South America. Leading a large and competitive agricultural state, Lula generally opposed and criticized farm subsidies, and this position has been seen as one of the reasons for the walkout of developing nations and subsequent collapse of the Cancún World Trade Organization talks in 2003 over G8 agricultural subsidies. Brazil played an important role in negotiations regarding internal conflicts in Venezuela and Colombia, and concentrated efforts on strengthening Mercosur. During the Lula administration, Brazilian foreign trade increased dramatically, changing from deficits to several surpluses after 2003. In 2004, the surplus was US$29 billion, due to a substantial increase in global demand for commodities. Brazil also provided UN peace-keeping troops and led a peace-keeping mission in Haiti. According to The Economist of 2 March 2006, Lula had a pragmatic foreign policy, seeing himself as a negotiator, not an ideologue, a leader adept at reconciling opposites. As a result, he befriended both Venezuelan president Hugo Chávez and U.S. President George W. Bush. Lula also gained increasing stature in the Southern hemisphere through economic growth in Brazil. In 2008, he was said to have become a "point man for healing regional crises," as in the escalation of tensions between Colombia, Venezuela and Ecuador. Former Finance Minister, and current advisor, Delfim Netto, said: "Lula is the ultimate pragmatist." He travelled to more than 80 countries during his presidency. A goal of Lula's foreign policy was for the country to gain a seat as a permanent member of the United Nations Security Council. In this he was unsuccessful. Lula was considered to have pulled off a major coup with Turkey in regards to getting Iran to send its uranium abroad in contravention of western calls. The condemnation of Iranian Sakineh Mohammadi Ashtiani for the crime of adultery, with a sentence of execution by stoning led to calls for Lula da Silva's intervention on her behalf. On the issue, Lula commented that "I need to respect the laws of a [foreign] country. If my friendship with the president of Iran and the respect that I have for him is worth something, if this woman has become a nuisance, we will receive her in Brazil." The Iranian government, however, declined the offer. Lula da Silva's actions and comments sparked controversy. Mina Ahadi, an Iranian Communist politician, welcomed Lula da Silva's offer of asylum for Ashtiani, but also reiterated a call for an end to stoning altogether and requesting a cessation of recognition and support for the Iranian government. Jackson Diehl, Deputy editorial page Editor of The Washington Post, called Lula da Silva the "best friend of tyrants in the democratic world" and criticised his actions. Shirin Ebadi, Iranian human rights activist and Nobel Peace Prize winner viewed Lula da Silva's intervention in a more positive light, calling it a "powerful message to the Islamic Republic." In the final month of his administration, his government officially recognized Palestine as a state, with a number of latin American countries following suit. Lula's administration was plagued by corruption scandals, notably the mensalão scandal and Escândalo dos Sanguessugas [pt] in his first term. The Brazilian Attorney-General presented charges against 40 politicians and officials involved in the Mensalão affair, including several charges against Lula himself. Top officials involved, such as Roberto Jefferson, José Dirceu, Luiz Gushiken and Humberto Costa denied he was aware of any wrongdoing; but one of his own party members, Arlindo Chinaglia, alleged that Lula had been warned that the corruption existed. Having lost numerous government aides in the face of political turmoil, Lula survived largely unscathed in the eyes of the public, with overwhelming approval rates. His administration was heavily criticized for relying on local political barons, like José Sarney, Jader Barbalho, Renan Calheiros and Fernando Collor to ensure a majority in Congress. He did lose some important votes in Congress however, such as when the Senate barred a tax on financial transactions from being reinstated. Another frequent reproach was his ambiguous treatment of the left wing of the PT. Analysts felt that he would occasionally give in to left-wing calls for tighter government control on media and increased state intervention: in 2004, he pushed for the creation of a "Federal Council of Journalists" (CFJ) and a "National Cinema Agency" (Ancinav), the latter designed to overhaul funding for electronic communications. Both proposals ultimately failed amid concerns over the effect of state control on free speech. 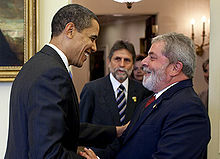 Fernando Cardoso, Lula's predecessor as president, accused Lula of denying the positive achievements of the Cardoso administration. Before a G-20 summit in London in March 2009, Lula caused an uproar by declaring that the economic crisis was caused by "the irrational behavior of white people with blue eyes, who before seemed to know everything, and now have shown they don't know anything." When wanted Italian terrorist Cesare Battisti was arrested in Rio de Janeiro on 18 March 2007 by Brazilian and French police officers, Brazilian Minister of Justice Tarso Genro granted him status as a political refugee, a controversial decision which divided Italy and the Brazilian and international press. On 5 February 2009, the European Parliament adopted a resolution in support of Italy and held a minute's silence in memory of Battisti's victims. On 18 November 2009, the Brazilian Supreme Court declared the refugee status illegal and allowed Battisi's extradition, but also stated that the Brazilian constitution gave the president personal powers to deny the extradition if he chose to, effectively putting the final decision in the hands of Lula. Lula decided to bar extradition of Battisti. On 31 December 2010, Lula's last day in office, the decision not to allow extradition was officially announced. Battisti was released on 9 June 2011 from prison after the Brazilian Constitutional Court denied Italy's request to extradite him. Italy planned to appeal to the International Court of Justice in The Hague. As of May 2017, Battisti still lived in Brazil. Lula da Silva claimed on Brazilian public television that he did not know anything about the scandals. He also said that people who did not agree with paying a tax for each check issued and/or financial transaction were people who illegally failed to pay their income tax. In 2014, Brazil began Operação Lava Jato (English: Operation Car Wash), resulting in several arrests and convictions, including nine suits against Lula. In April 2015, the Public Ministry of Brazil opened an investigation into allegations of influence peddling by Lula, which claimed that between 2011 and 2014 he had lobbied for government contracts in foreign countries for the Odebrecht company and had also persuaded the Brazilian Development Bank to finance the projects in Ghana, Angola, Cuba, and the Dominican Republic. In June 2015 Marcelo Odebrecht, president of Odebrecht, was arrested on charges that he had paid politicians $230 million in bribes. Three other company executives were also arrested, as well as the chief executive of Andrade Gutierrez, another construction conglomerate. On 4 March 2016, as part of "Operation Car Wash", Brazilian authorities raided Lula's home. After the raid, the police detained Lula for questioning. A police statement alleged that Lula had collaborated in illegal bribes from the oil company Petrobras, which had benefited his political party and presidential campaign. Prosecutor Carlos Fernando said "The favors to Lula from big construction companies involved in the fraud at Petrobras were many and hard to quantify". Lula said that he and his party were being politically persecuted. On 16 March 2016, Rousseff appointed Lula as her chief of staff, a position comparable to that of prime minister. This would have shielded him from arrest due to the immunity that went with the position. Cabinet ministers in Brazil are among close to seven hundred senior government officials enjoying special judicial standing, which means they can only be tried by Brazil’s Supreme Federal Court. Supreme Court Judge Gilmar Mendes suspended Lula da Silva's appointment on the grounds that Rousseff was trying to help Lula circumvent prosecution. On 14 September 2016, prosecutors filed corruption charges against Lula, accusing him of being the mastermind or 'maximum commander of the scheme'. On 19 September 2016, 13th Circuit (Paraná) federal judge Sérgio Moro, who was leading the corruption probe, accepted an indictment for money laundering against Lula and his wife Marisa Leticia Lula da Silva. On 11 May 2017, Lula answered a summons by appearing in Curitiba, and was questioned by Moro. The closed-court hearing lasted five hours. Thousands of Lula supporters went to Curitiba, together with Dilma Rousseff. After the hearing, Lula and Rousseff gave speeches to his supporters; Lula attacked what he called bias in the Brazilian media. Lula was found guilty by the lower court of accepting R$3.7 million in bribes ($1.2 million US) in the form of improvements to a beachfront house, alleged to be his property, made by a construction company Grupo OAS [pt], which in turn received lucrative contracts from the state-owned oil company Petrobras. On 12 July 2017, he received a sentence of nine and a half years in prison. However, he remained free pending his appeal. Lula's lawyer accused the judge of bias and the judge replied that nobody, not even the former president, should be above the rule of law. If Lula cannot run for president as he plans, this would have a strong effect on the 2018 presidential elections, as Lula is a popular candidate and his absence would generate a big power vacuum in the left. On 25 January 2018, the Appeal Court of Porto Alegre found Lula guilty of corruption and money laundering and sentenced him to 12 years of prison, for one of the nine law processes, as the other eight are still in course. On 26 March 2018 the Supreme Federal Tribunal of Brazil upheld the sentence of the Appeal Court, thus ending the case. Lula also faced other charges including money laundering, influence peddling and obstruction of justice. On 5 April 2018, Brazil’s Supreme Federal Court (STF) voted 6–5 to deny Lula's habeas corpus petition. The court ruled that Lula must begin serving the sentence relating to the 12 July 2017 judgment, despite not having exhausted all of his rights to appeal. Lula and his political party vowed to continue his campaign from prison following the court's decision that he must surrender himself by 6 April. The head of Brazil's army, General Eduardo Villas Boas, called for Lula to be placed behind bars. Lula failed to turn himself in at the scheduled time, he but did so on the following day on 7 April. After the imprisonment of Lula, protesters took to the streets in cities across Brazil. Lula's prison created the movement Free Lula. On 17 April 2018, Brazilian senators who were members of the legislature's Human Rights Commission, the Argentinian Nobel Prize laureate, Adolfo Perez Esquivel and the former president of Uruguay, José Pepe Mujica were not allowed to visit Lula in prison to acquire information of violation of Lula’s human rights. In June, the UN Goodwill Ambassador, Danny Glover expressed solidarity and support for Lula's presidential candidacy. On 8 July 2018, federal judge for the 4th region Rogério Favreto ordered Lula's release, a ruling that was overturned the same day by the president of the 4th regional court. Coercive conduct against Lula on 4 March 2016. The leaking of confidential data to the press. The leaking of illegally obtained phone conversation recordings to the press. An abusive strategy of temporary and preemptive imprisonments in order to obtain plea-bargaining deals implicating the former president. Because the judge’s chief of staff had posted on her Facebook page a petition calling for Lula’s imprisonment and the presiding judge of the appellate panel had, before the decision had been issued, praised the trial judge’s decision to convict Lula for corruption, an op-ed in The New York Times concluded that "Brazil’s democracy is now weaker than it has been since military rule ended". The newspaper was joined by a number of international intellectuals, activists and political leaders, from Noam Chomsky to a group of twelve United States Congressmen, who complained that the legal proceedings appeared to be designed to prevent Lula (the front-runner in opinion polls) from running for president in 2018. On 28 July 2016, Lula filed a 39-page petition with the UN's Human Rights Committee outlining alleged abuses of power. The petition claims that "Lula is a victim of abuse of power by a judge, with the complicity of prosecutors and the media". The petition was the first ever taken against Brazil which ratified the Committee’s protocol in 2009. The UN accepted the case and Brazil had six months to respond to the petition with the committee made of 18 international jurists. In November 2016, Lula's legal team filed additional evidence of abuses by the Brazilian justice system. and another document was filed on 5 October 2017, in Geneva, Switzerland reporting other facts, such as Judge Sérgio Moro’s attendance at the premiere of a film that depicted former President Lula as guilty despite the lack of any definitive decision against him at that time. Following Judge's Moro issuing of an arrest warrant for the ex-president, on April 6, 2018, Lula appealed to the UN"s Human Rights Committee to ask the government to prevent his arrest until he had exhausted all appeals. Lula argued that the Brazilian Supreme Court had narrowly adopted its ruling with only six votes against five, which “shows the need for an independent court to examine if the presumption of innocence was violated" in his case. The Human Rights Committee received a request for "interim measures" and was deliberating the request. However, the UN Human Rights Committee denied the request seeking emergency action against his imprisonment. On 28 May 2018, the Committee initiated a formal investigation into violations against basic judicial guarantees in Lula's case. In August, the UN Human Rights Committee "requested Brazil to take all necessary measures to ensure that Lula can enjoy and exercise his political rights while in prison, as candidate in the 2018 presidential elections." On 29 October 2011, through the Syrian-Lebanese Hospital of São Paulo, it was announced that Lula suffered from throat cancer, a malignant tumor in his larynx. He elected chemotherapy to counteract the tumor, and on 16 November, his press office released photos of his wife shaving his beard and hair, leaving him bald, although he retained his moustache. It was the first time he'd been seen without his beard since he left office. He was treated with radiation, and the cancer went into remission. 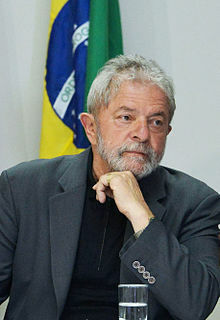 Lula announced his recovery in March 2012, as well as his return to politics. Fellow politician Dilma Rousseff, then president of Brazil, welcomed the news. 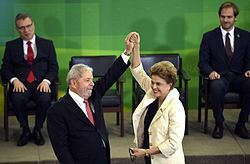 Contrary to rumors, Lula declared in early 2013 that he would no longer be a presidential candidate, supporting Dilma Rousseff for a second term. Lula da Silva was expected to join Rousseff's government, according to official media sources[who?]. The appointment raised concerns about his arrest and investigation. In 2017, Lula announced he would stand as the Workers' Party candidate for president again in the 2018 election. In September, he led a caravan of supporters to travel through the states of Brazil, starting with Minas Gerais, whose governor is Lula's political ally Fernando Pimentel. While traveling through the South of Brazil, the caravan became the target of protests. In Paraná, a campaign bus was shot, and in Rio Grande do Sul, rocks were thrown at pro-Lula militants. Despite Lula's imprisonment in April 2018, the Workers' Party insisted in keeping Lula as the party's presidential candidate. In a poll conducted by Ibope in June 2018, Lula led with 33% of vote intentions, with the PSL candidate Jair Bolsonaro polling second with 15%. The former president negotiated a national coalition with the PCdoB and regional alliances with the Socialist Party. The Workers' Party officially launched Lula as its candidate on 5 August 2018, in São Paulo. Actor Sérgio Mamberti read a letter written by Lula, who was unable to attend because of his prison sentence. Former São Paulo mayor Fernando Haddad was named as Lula's running mate and intended to represent Lula in events and debates. In the event that Lula be declared ineligible, Haddad will replace Lula as candidate, with Manuela d'Ávila replacing Haddad as the vice presidential candidate. In response to an appeal considering Lula as a political prisoner, the UN Human Rights Committee ruled on 17 August 2018 that it had requested the Brazilian government to allow Lula to exercise his political rights. In a 26 August poll, Lula had 39 percent of vote intentions within one month of the first round. The same opinion polling put Lula ahead of all his challengers in a second round run-off, including the nearest one, PSL candidate Jair Bolsonaro, by 52 to 32. Lula's candidacy was denied by the Superior Electoral Court on 31 August 2018, when the majority of the seven-judge panel voted to bar Lula from running in the presidential race. On 11 September 2018, Lula officially dropped out of the election and was replaced by former São Paulo mayor Fernando Haddad, whom Lula endorsed. Lula's brother died in January 2019. Lula's 7-year-old grandson died of meningitis in March 2019. Academy Award-nominated film director Fábio Barreto directed the 2009 Brazilian film Lula, Son of Brazil that depicts the life of Lula up to 35 years of age. The film was a commercial and critical failure, accused of being election propaganda, and producers even aired it for free. Some observers in Brazil said the film was a sign of cult of personality. The series The Mechanism on Netflix deals with Operation Car Wash and features a character that corresponds to Lula, João Higino, played by Arthur Kohl. ^ Brocchetto, Marilia; Darlington, Shasta; Botelho, Greg (18 March 2016). "Brazilian judge blocks Lula appointment – but fight far from over". CNN. Retrieved 3 December 2017. ^ a b Jeff Wallenfeldt (10 April 2018). "Luiz Inácio Lula da Silva". Encyclopædia Britannica. Retrieved 27 July 2018. ^ a b Barrionuevo, Alexei (26 August 2012). "Luiz Inácio Lula da Silva". The New York Times. 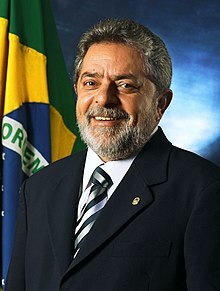 ^ "Luiz Inácio Lula da Silva" (in Portuguese). Biblioteca da Presidência da República. Retrieved 30 June 2017. ^ Throssell, Elizabeth 'Liz' (30 September 2010). "Lula's legacy for Brazil's next president". BBC News. British Broadcasting Corporation. Retrieved 29 March 2012. ^ "Hemispheres" (PDF). Tufts. 2004. Retrieved 17 August 2010. ^ "Ex-President 'Lula' of Brazil Surrenders to Serve 12-Year Jail Term". New York Times. 7 April 2018. Retrieved 27 October 2018. ^ "Lula é o quinto presidente da história do Brasil a ser preso. Saiba quem são os outros". Gazeta do Povo. 5 April 2018. Retrieved 27 July 2018. ^ "Lula leaves office as Brazil's 'most popular' president". BBC News. British Broadcasting Corporation. 31 December 2010. Retrieved 4 January 2011. ^ "'The Most Popular Politician on Earth'". Newsweek. 31 December 2010. Archived from the original on 29 December 2010. Retrieved 4 January 2011. ^ "Lula's last lap". The Economist. 8 January 2009. Retrieved 4 January 2011. ^ "The 100 Most Influential People in the World for 2010". Time: 20. 10 May 2010. Retrieved 9 June 2010. ^ Carroll, Rory (10 March 2010). "Lula stubs out smoking habit". The Guardian. London. Retrieved 29 March 2012. ^ "Brazil ex-President Lula diagnosed with throat cancer". BBC News. British Broadcasting Corporation. 29 October 2011. ^ "Brazil judge blocks Lula appointment to government". BBC News. British Broadcasting Corporation. Retrieved 17 March 2016. ^ "Justice Gilmar Mendes suspends Lula's nomination as Chief of Staff". Correio Braziliense (in Portuguese). Retrieved 18 March 2016. ^ "Lula é condenado a nove anos de prisão". Veja (in Portuguese). Grupo Abril. 12 July 2017. Retrieved 12 July 2017. ^ Brooks, Brad (12 July 2017). "Brazil's Former President Found Guilty Of Corruption". Huffington Post. Retrieved 12 July 2017. ^ Sergio Lima, Mario; Adghirni, Samy (5 April 2018). "Brazilian Judge Orders Arrest of Former President Lula". Bloomberg. Retrieved 6 April 2018. ^ Lopes, Marina (5 April 2018). "Lula verdict plunges Brazil into political chaos ahead of presidential election". The Washington Post. ISSN 0190-8286. Retrieved 5 April 2018. ^ "Brazil's Lula surrenders to police". BBC News. 8 April 2018. Retrieved 27 April 2018. ^ "Brazil's jailed former president Lula barred from running again by electoral court". Washington Post. ^ "Jailed Lula pulls out of Brazilian vote". 12 September 2018 – via www.bbc.com. ^ Brooks, Brad. "Brazil's Lula should have political rights: U.N. Human Rights..." U.S. Retrieved 24 August 2018. ^ "Pesquisa Datafolha: Lula, 39%; Bolsonaro, 19%; Marina, 8%; Alckmin, 6%; Ciro, 5%". G1 (in Portuguese). 22 August 2018. Retrieved 26 August 2018. ^ Feltrin, Ricardo (6 April 2005). ""Lula é um católico a seu modo", diz d. Cláudio Hummes". Folha de S.Paulo. Retrieved 3 October 2010. ^ Paraná, Denise (2009). Lula, o filho do Brasil. Objetiva. p. ???. Retrieved 25 October 2018. ^ Narciso, Paulo. "Da distante Paulicéia, Lula vinha namorar todas as noites". Hoje em Dia (in Portuguese). Archived from the original on 21 October 2011. Retrieved 14 December 2009. ^ Fordeleone, Yolanda. "Lurian, filha de Lula, foi atendida no hospital Sírio-Libanês". Estadão. Grupo Estado. Retrieved 3 October 2010. ^ Souza Cruz, Bruna; Bianchi, Paula (2 February 2017). "Marisa Letícia tem morte cerebral, e família autoriza doação de órgãos". UOL Notícias. Grupo Folha. Retrieved 2 July 2017. ^ a b "Lula: Fourth time lucky?". BBC News. British Broadcasting Corporation. 28 October 2002. Retrieved 27 April 2007. ^ a b "Biography". Presidency of the Federative Republic of Brazil. 2005. Archived from the original on 13 December 2007. Retrieved 2 September 2007. ^ "Eleições 2006 – Com votação recorde, Lula chega ao segundo mandato". G1. Grupo Globo. Retrieved 3 October 2010. ^ a b Forero, Juan (4 October 2010). "Brazilian president's handpicked successor leads, faces runoff". The Washington Post. ^ "Brazil re-elects President Lula". BBC News. British Broadcasting Corporation. 30 October 2006. Retrieved 27 April 2007. ^ Newsroom (27 August 2007). "Brazilian President Vows Not to Seek a Third Term". Mercopress via Brazzil Magazine. Archived from the original on 25 December 2007. Retrieved 22 June 2013. ^ "Brazil's jailed former leader Lula ends presidential bid". 11 September 2018 – via www.reuters.com. ^ "Lula bids a tearful goodbye". Al Jazeera English. 30 December 2010. Retrieved 29 March 2012. ^ "Where dinausaurs still roam". The Economist. 5 February 2009. Retrieved 12 May 2009. ^ Kirksey, Emily (21 June 2006). "Lula – Brazil's Lost Leader". Council on Hemispheric Affairs. Retrieved 5 April 2008. ^ "Brazil hit by debt downgrade". BBC News. British Broadcasting Corporation. 21 June 2002. Retrieved 9 August 2007. ^ a b "Henrique de Campos Meirelles". Banco Central do Brazil. Archived from the original on 27 September 2007. Retrieved 9 August 2007. ^ Balbi, Sandra (18 December 2005). "Economistas Alertam para Desindustrialização". Folha de S.Paulo (in Portuguese). Archived from the original on 22 December 2008. Retrieved 5 April 2008. ^ "Brazil to pay off IMF debts early". BBC News. British Broadcasting Corporation. 14 December 2005. Retrieved 27 April 2007. ^ Newsroom. "O Chefe (The Boss) by Ivo Patarra". Archived from the original on 22 April 2018. Retrieved 19 December 2018. ^ Clemente, Isabel; Leal, Andréa; Neves, Maria Laura. "Enfim, Lula privatizou..." Época (in Portuguese). Rede Globo. Retrieved 5 April 2008. ^ Parra-Bernal, Guillermo; Pimentel, Lester. "Brazil Became Net Creditor for First Time in January". Bloomberg.com. Bloomberg. Retrieved 6 January 2008. ^ "Lula e o lucro recorde dos bancos" (in Portuguese). La Agencia Latinoamericana de Información – ALAI. 16 August 2007. Archived from the original on 24 November 2011. Retrieved 23 June 2009. ^ Padgett, Tim (26 April 2004). "Luiz Inácio Lula da Silva". Time. Retrieved 26 March 2008. ^ Cirilo Junior (16 January 2010). "Tropas brasileiras ainda lideram missão no Haiti, diz Jobim". Folha de S.Paulo. Retrieved 29 March 2012. ^ "Brazil: Lula's leap". The Economist. 2 March 2006. ^ Kraul, Chris; McDonnell, Patrick J. (5 October 2008). "Brazil's Lula takes center stage in Latin America". Los Angeles Times. Retrieved 2 July 2009. ^ a b c Davies, Rhodri (22 May 2010). "The axis of Brazil". Al Jazeera English. Retrieved 3 October 2010. ^ a b Diehl, Jackson (3 August 2010). "Lula: Stonewalled by Iran". The Washington Post. Retrieved 26 July 2017. ^ "Iran stoning woman offered asylum by Brazil's president Lula". The Guardian. London. 1 August 2010. ^ "Press Release 29: On Brazilian offer of asylum to Sakineh Mohammadi Ashtiani" (Press release). International Committee Against Stoning. 31 July 2010. Archived from the original on 11 May 2011. Retrieved 3 October 2010. ^ Ahadi, Mina (2 August 2010). "Open letter to the Brazilian president Luiz Inácio Lula da Silva A regime of stoning should not be recognised". International Committee Against Stoning. Archived from the original on 11 May 2011. Retrieved 3 October 2010. ^ Mirian (21 August 2010). "Porta voz do Comitê Internacional contra Apedrejamento envia carta aberta a Lula". Veja. Grupo Abril. Retrieved 3 October 2010. ^ Amauri Arrais Do G1, em São Paulo (30 July 2010). "G1 – Lula pode ajudar a libertar condenada a apedrejamento, diz ativista iraniana – notícias em Mundo". G1. Grupo Globo. Retrieved 3 October 2010. ^ Shirin Ebadi: When Adultery Means Death. Huffingtonpost.com. Retrieved on 29 November 2010. ^ "Lula sabia, sim, do mensalão, confirma Chinaglia". Veja. Grupo Abril. 30 October 2009. Retrieved 22 February 2013. ^ Caram, Fabio. Conselho, imprensa e controle, Observatório da Imprensa, 17 August 2004. ^ Op. Ed. O Estado de S. Paulo, 6 September 2009. ^ "Lula's Tactic to Win: Denying His Predecessor Has Ever Done Anything Good". Brazzil.com. 7 February 2010. Archived from the original on 2 April 2012. Retrieved 22 February 2013. ^ Barrionuevo, Alexei (2 April 2009). "Brazil's 'Teflon' Leader Nicked by Slump". The New York Times. Retrieved 23 July 2017. ^ Bonin, Robson (31 December 2010). "Lula nega extradição de Cesare Battisti para a Itália". G1 (in Portuguese). Grupo Globo. ^ "Italy to appeal against Brazil's refusal to extradite convicted killer". The Guardian. 9 June 2011. ^ a b "Veja tudo o que Lula 'não sabia'". Estadão\ (in Portuguese). Grupo Estado. 2 August 2007. ^ "Brazil's Lula sentenced to nearly 10 years in jail". www.aljazeera.com. ^ "Brazil court upholds Lula da Silva's graft conviction". www.aljazeera.com. ^ "Agregador de pesquisas eleitorais do Poder360". Poder360. ^ "Brazil: The Car Wash Scandal". www.aljazeera.com. ^ "As suspeitas de tráfico de influência internacional sobre o ex-presidente Lula: O Ministério Público Federal abre uma investigação contra o petista – ele é suspeito de ajudar a Odebrecht em contratos bilionários". Época. Rede Globo. 30 April 2015. ^ "Brazil Arrests Head of Odebrecht in Petrobras Scandal". The New York Times. 19 June 2015. ^ Dan Horch (19 June 2015). "Brazil Arrests Head of Odebrecht in Petrobras Scandal". New York Times. Retrieved 26 July 2017. ^ Romero, Simon. "Police Raid Home of Ex-President Luiz Inácio Lula da Silva of Brazil". The New York Times. Rio de Janeiro. Retrieved 4 March 2016. ^ "Police Question Brazil's Ex-President in Corruption Probe". The Premium Herald. 4 March 2016. Retrieved 4 March 2016. ^ a b "Former Brazil president Lula da Silva detained amid corruption investigation". Euronews. 4 March 2016. Retrieved 4 March 2016. ^ Machado, Adriano (4 March 2016). "Brazil police detain former president Lula in anti-graft probe: source". Sao Paulo. Reuters. Retrieved 4 March 2016. ^ "Brazil's Lula received 'many' favors from corrupt companies". The Citizen. AFP. Archived from the original on 4 March 2016. Retrieved 4 March 2016. ^ Kenneth Rapoza (29 July 2016). "Brazil's Ex-President Lula Wants UN To Save Him From Petrobras Noose". Forbes. Retrieved 26 January 2017. ^ "No depoimento à PF, Lula critica Lava Jato e admite amizade com Bumlai". Folha de S.Paulo (in Portuguese). 18 December 2015. Retrieved 26 January 2017. ^ "Assessoria de Lula critica Lava Jato e compara operação com vídeo do Porta dos Fundos" (in Portuguese). InfoMoney. 11 October 2016. ^ Romero, Simon (16 March 2016). "Ex-President 'Lula' Joins Brazil's Cabinet, Gaining Legal Shield". The New York Times. ^ "Supreme Court Justice in Brazil Blocks appointment for Ex-President". The Premium Herald. 19 March 2016. Retrieved 19 March 2016. ^ "Brazilian judge blocks Lula da Silva appointment". CNN. Retrieved 19 March 2016. ^ "'Lula,' Brazil's Ex-President, Is Charged With Corruption". The New York Times. 14 September 2016. Retrieved 15 September 2016. ^ Phillips, Dom. "Brazil's ex-president Lula decries persecution as he faces corruption charges in court". The Guardian. Retrieved 12 May 2017. ^ a b Londoño, Ernesto (12 July 2017). "Ex-President of Brazil Sentenced to Nearly 10 Years in Prison for Corruption". The New York Times. Retrieved 10 July 2017. ^ Phillips, Dom (12 July 2017). "Brazil's ex-president Lula sentenced to nearly 10 years in prison for corruption". The Guardian. ISSN 0261-3077. Retrieved 14 July 2017. ^ a b c "Former Brazilian President Lula found guilty of corruption". Reuters. 12 July 2017. Retrieved 10 July 2017. ^ "Brazil ex-President Lula loses appeal". BBC News. 2018. Retrieved 3 September 2018. ^ "Brasile, confermata la condanna a 12 anni per Lula: respinti tutti i ricorsi dei legali - Il Fatto Quotidiano". Il Fatto Quotidiano (in Italian). 26 March 2018. Retrieved 3 September 2018. ^ "Profile: Luiz Inacio Lula da Silva". BBC News. 12 July 2017. Retrieved 14 July 2017. ^ "AO VIVO: STF rejeita habeas corpus de Lula por 6 votos a 5," Estadão Ao Vivo, 5 April 2018. Retrieved 5 April 2018. ^ "Lula ordered to jail, plunging Brazil into political chaos ahead of presidential election," Washington Post, 5 April 2018, Retrieved 5 April 2018. ^ "Lula Da Silva, Brazil's Beloved Ex-President, Says He Will Surrender After Standoff," NPR, 7 April 2018, Retrieved 7 April 2018. ^ "Lula: Former Brazilian president surrenders to police," BBC, 7 April 2018, Retrieved 7 April 2018. ^ "Actor Danny Glover Joins Free Lula Occupiers in Brazil". Institute of the Black World 21st Century. 2 June 2018. Retrieved 8 June 2018. ^ France-Presse, Agence (8 July 2018). "Brazil judge orders Lula to remain in prison overturning earlier ruling to release former president". The Telegraph. ISSN 0307-1235. Retrieved 9 July 2018. ^ Robertson, Geoffrey. "The case for Lula". Geoffrey Robertson Q.C. Retrieved 9 April 2018. ^ Brazilian Federal Regional Court President Praises Moro’s Decision published on 20 March 2018. ^ UN Lawyer Geoffrey Robertson to monitor Lula’s appeal hearing Brazilian justice system scrutinized by international legal community published by "BrasilWire" on 23 January 2018. ^ "FORMER BRAZIL PRESIDENT LULA FILES ADDITIONAL EVIDENCE OF ABUSES COMMITTED AGAINST HIM BY BRAZILIAN JUSTICE SYSTEM TO UNITED NATIONS HUMAN RIGHTS COMMITTEE". A Verdade de Lula. 16 November 2016. Retrieved 27 July 2018. ^ "LULA'S DEFENSE UPDATES THE UN HUMAN RIGHTS COMMITTEE ON VIOLATIONS BY MORO AND APPELLATE COURT OF THE 4TH REGION". A Verdade de Lula. 6 October 2017. Retrieved 27 July 2018. ^ "UN denies Lula's request for emergency action against his imprisonment". MercoPress. Retrieved 20 June 2018. ^ "Brazil Slaps Down UN Human Rights Committee Request on Lula". www.bloomberg.com. Retrieved 24 August 2018. ^ "Brazil's Lula da Silva shaves beard in cancer battle". BBC News. British Broadcasting Corporation. 16 November 2011. ^ "Lula da Silva announces his back in politics after defeating cancer". MercoPress. 29 March 2012. Retrieved 29 March 2012. ^ "Lula Da Silva to become Minister". The Premium Herald. 15 March 2016. Retrieved 15 March 2016. ^ "Após depoimento, Lula retoma caravana por Minas Gerais". Gazeta do Povo. ^ "Ônibus da caravana de Lula no Paraná são atingidos por tiros". G1. ^ "Lula tem 33%, Bolsonaro, 15%, Marina, 7%, e Ciro, 4%, aponta pesquisa Ibope". G1. ^ "Da cadeia, Lula articulou ações que resultaram no isolamento de Ciro". Folha de S.Paulo. 1 August 2018. ^ "PT anuncia Haddad como vice na chapa de Lula e acordo com o PCdoB". G1. ^ "UN Rules Ex-President Lula Can Stand in Elections Despite Sentence". sputniknews.com. Retrieved 17 August 2018. ^ "Brazil electoral court bars Lula from presidential race". www.yahoo.com. ^ correspondent, Tom Phillips Latin America; Phillips, Dom (11 September 2018). "Jailed leftwing leader Lula drops out of Brazil presidential race" – via www.theguardian.com. ^ a b "Lula back in Brazil prison after grandson's funeral". BBC News. 3 March 2019. ^ Holden, Stephen (12 January 2012). "'Lula: Son of Brazil,' Directed by Fábio Barreto – Review". The New York Times. ISSN 0362-4331. Retrieved 14 July 2017. ^ "Filme sobre Lula é fracasso de bilheteria, diz ´El país`". Band.com.br. Grupo Bandeirantes. Archived from the original on 19 April 2013. ^ "Lula, Son of Brazil (Lula, o Filho do Brasil) (2012)". Rotten Tomatoes. Retrieved 26 July 2017. ^ "Filme sobre Lula pode influenciar eleição presidencial, diz 'NYT'". BBC Brasil. British Broadcasting Corporation. ^ "Dilma admite que filme de Lula pode ajudar nas eleições de 2010". Veja. Grupo Abril. 24 November 2009. ^ "CineB exibe em comunidades filme sobre Lula". Sindicato dos Bancários e Financiários de São Paulo, Osasco e Região. 17 May 2012. ^ "O culto da personalidade na indicação ao Oscar". Veja. Grupo Abril. 23 September 2010. Archived from the original on 25 January 2011. ^ ""O Mecanismo": saiba quais personagens foram inspirados em nomes como Lula e Moro na série da Netflix". Gauchazh. Gauchazh. 23 March 2018. Bourne, R (2008). Lula of Brazil : The story so far. Berkeley, CA: University of California Press. ISBN 978-0-520-24663-8. Cardim de Carvalho, Fernando J. (2007). "Lula's Government in Brazil: A New Left or the Old Populism?". In Arestis, Philip; Saad-Filho, Alfredo (eds.). Political Economy of Brazil. London: Palgrave Macmillan. pp. 24–41. ISBN 978-0-230-54277-8. Profile: Luiz Inácio Lula da Silva. BBC News. 28 January 2010. Moore, Michael (20 April 2010). "The 2010 TIME 100: Luiz Inácio Lula da Silva". Time. "Transcript of statements by Luiz Inácio Lula da Silva, President of Brazil, to the high-level meeting for foreign investors" (PDF). United Nations Conference on Trade and Development. 29 January 2004. (Meeting press release. "General Debate of the 64th Session" (2009). United Nations.